Using coupled terrestrial and coastal zone models, we investigated the impacts of deglaciation and anthropogenic inputs on the CO2–H2O–CaCO3 system in global coastal ocean waters from the Last Glacial Maximum (LGM: 18,000 year BP) to the year 2100. With rising sea level and atmospheric CO2, the carbonate system of coastal ocean water changed significantly. We find that 6 × 1012 metric tons of carbon were emitted from the coastal ocean, growing due to the sea level rise, from the LGM to late preindustrial time (1700 AD) because of net heterotrophy and calcification processes. This carbon came to reside in the atmosphere and in the growing vegetation on land and in uptake of atmospheric CO2 through the weathering of rocks on land. It appears that carbonate accumulation, mainly, but not exclusively, in coral reefs from the LGM to late preindustrial time could account for about 24 ppmv of the 100 ppmv rise in atmospheric CO2, lending some support to the “coral reef hypothesis”. In addition, the global coastal ocean is now, or soon will be, a sink of atmospheric CO2. The temperature rise of 4–5°C since the LGM led to increased weathering rates of inorganic and organic materials on land and enhanced riverine fluxes of total C, N, and P to the coastal ocean of 68%, 108%, and 97%, respectively, from the LGM to late preindustrial time. During the Anthropocene, these trends have been exacerbated owing to rising atmospheric CO2, due to fossil fuel combustion and land-use practices, other human activities, and rising global temperatures. River fluxes of total reactive C, N, and P are projected to increase from late preindustrial time to the year 2100 by 150%, 380%, and 257%, respectively, modifying significantly the behavior of these element cycles in the coastal ocean, particularly in proximal environments. 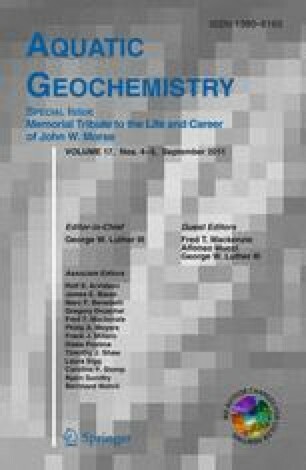 Despite the fact that the global shoal water carbonate mass has grown extensively since the LGM, the pHT (pH values on the total proton scale) of global coastal waters has decreased from ~8.35 to ~8.18 and the carbonate ion concentration declined by ~19% from the LGM to late preindustrial time. The latter represents a rate of decline of about 0.028 μmol CO3 2− per decade. In comparison, the decrease in coastal water pHT from the year 1900 to 2000 was about 8.18–8.08 and is projected to decrease further from about 8.08 to 7.85 between 2000 and 2100, according to the IS92a business-as-usual scenario of CO2 emissions. Over these 200 years, the carbonate ion concentration will fall by ~120 μmol kg−1 or 6 μmol kg−1 per decade. This decadal rate of decline of the carbonate ion concentration in the Anthropocene is 214 times the average rate of decline for the entire Holocene. Hence, when viewed against the millennial to several millennial timescale of geologic change in the coastal ocean marine carbon system, one can easily appreciate why ocean acidification is the “other CO2 problem”. This research was supported by NSF grants OCE-0749401 and OCE-0749404, and Arthur L. Howland of the Department of Earth and Planetary Sciences, Northwestern University. We are grateful to Alfonso Mucci, Guy Munhoven, and two anonymous reviewers for their insightful and helpful comments and bibliographic references. Any errors or omissions are ours.